Sieve(stain) the gram flour in a bowl, add semolina and sugar, mix it properly. Add water and and lemon juice, mix it properly, cover it and leave it for 15 minutes. In the meanwhile, boil 2 glasses of water in a steamer or pan and grease a deep plate or cake tin. After 15 minutes, add turmeric powder, ginger, green chilli paste, salt and 1 tsp of oil, mix it well. Add fruit salt(eno) on batter, add 1 tbsp of water on fruit salt, mix it for 10-12 seconds. Pour the batter into the greased cake tin/plate immediately after mixing it. Open the lid of the pan/steamer (after 15 minutes of boiling the water) and place the batter tin/plate inside the pan/steamer. Put the lid and cook it for 20 minutes on medium flame (do not open the lid of the pan in between). Turn off the flame and let it cool down a bit. 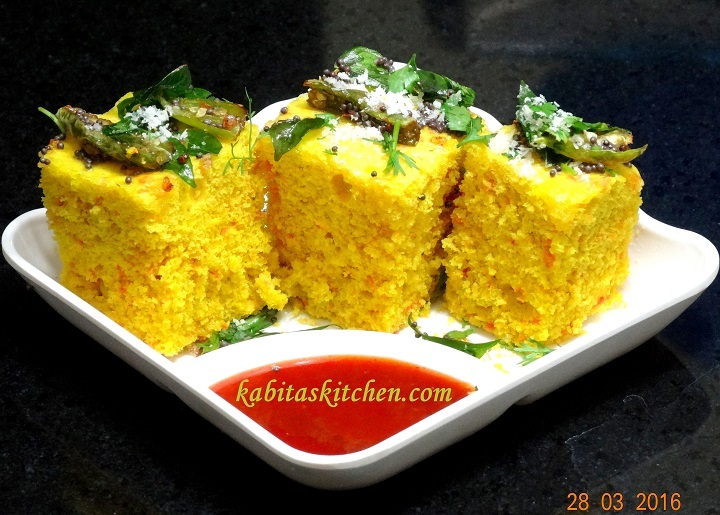 Take out the dhokla from pan/tin and cut it into pieces. Heat oil in a tadka pan, add asafoetida, mustard seeds, green chilli, curry leaves, sugar and salt. Fry it for few seconds, turn off the flame and pour the tadka on the dhokla. Garnish with fresh coconut and coriander leaves, ready to serve, serve with green chutney and red chutney. Peel the mangoes, chop into pieces and discard the seeds. 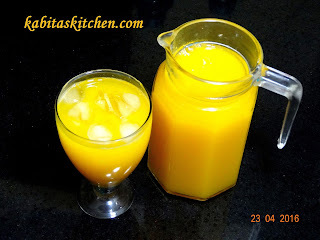 Put the pulp in a pressure cooker, add one glass of water and close the lid. Turn on the flame and put the pressure cooker on it, boil it for 4-5 whistles on high flame. After 4-5 whistles, turn off the flame and let it cool down completely. Add sugar and one glass of water in a pan, put it on gas stove and heat it on medium flame till it starts to boiling. Let the sugar dissolve completely (It takes approx 2 minutes on medium flame). Once the sugar has dissolved, turn off the flame and let it cool down completely. Put the boiled mango pulp along with the it's water and sugar syrup in blending jar, blend it into smooth paste. Take it out in a big pot and add 2 glasses of water(adjust the water based on your taste), stir it well. Cover it and put it in refrigerator for 2-3 hours. Ready to serve, serve it with ice cubes. 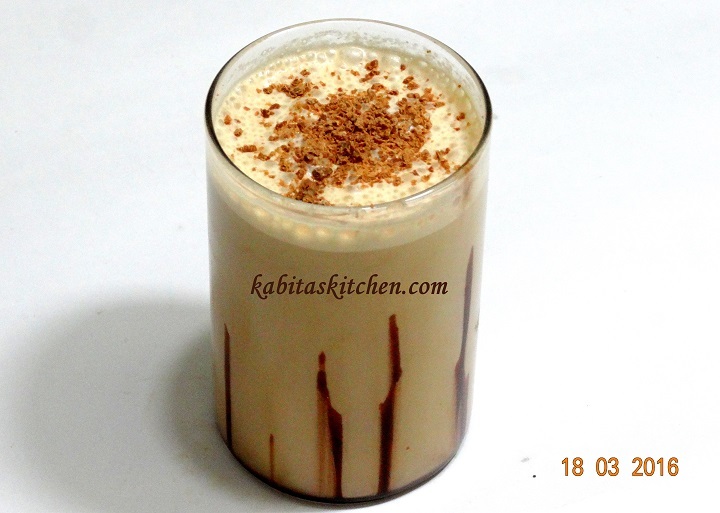 Put milk, coffee powder, sugar and ice cubes in a blending jar. Close the jar properly and blend it for 10-15 seconds. Coat the inner surface of the serving glass with chocolate syrup. Pour the blended coffee into the serving glass and grate little chocolate over it. Grate/mash the boiled potato in a bowl. Add garam masala powder, red chilli powder, coriander leaves, fennel seeds, dry mango powder, green chilli and salt. Mix it properly, stuffing is ready. Slit the chilli lengthwise and remove all the seeds. Take one chilli at a time and stuff the prepared aloo masala inside. Repeat the process to stuff the remaining chillies. In a bowl: add gram flour, turmeric powder, red chilli powder, garam masala powder and little salt, mix it. Add water to make thick batter, add ginger garlic paste and stir it well. Turn on the flame and heat a pan on high flame, add sufficient oil and let it heat. Once the oil is heated properly, reduce the flame to medium. 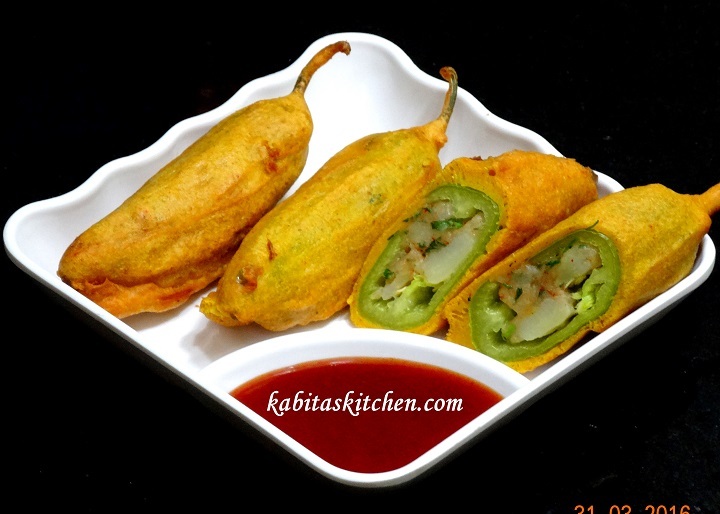 Coat the stuffed chilli with gram flour batter and gently drop into the hot oil. Fry it on medium flame till it turns golden brown, keep flipping in between. Take it out on the kitchen towel to absorb extra oil, repeat the process for frying remaining stuffed chillies. Rajasthani Mirchi vada is ready to serve with tomato ketchup or red chutney. Heat a pressure cooker pan, add oil and let it heat. Add cumin seeds and fry it for few seconds. Add green chilli and onions, fry it till onions turn golden brown(approx 2-3 minute). Add ginger garlic paste, cook it for a minute on low flame. Add potato and fry it for 2 minutes on medium flame, keep stirring in between. Add turmeric powder, red chilli powder, cumin powder and coriander powder, mix it. Add green peas, tomato puree and mix it, cover the pan and cook it for a minute on low flame. Add one glass of water, salt and garam masala powder, mix it well. Close the lid and cook it for 2 whistles on medium flame. Turn off the flame and let the cooker cool down. 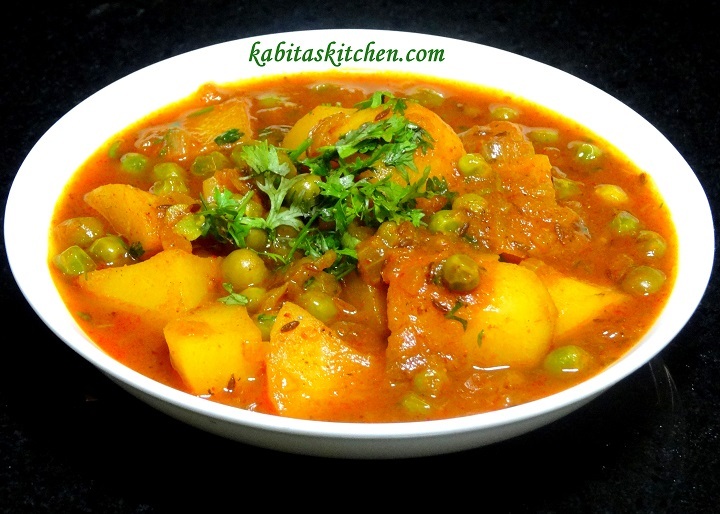 Garnish with coriander leaves and serve hot with roti, poori, paratha or rice. Add 3 tbsp cooking oil in the maida and mix it properly. Add water and mix it, add water and knead it into stiff dough (stiffer than roti dough). Cover it and leave it for 15 minutes. Turn on the flame, heat a pan and reduce the flame to low. Add desiccated coconut and roast it for a minute, keep stirring. Take it out in a plate and keep it aside, add ghee in the same pan, let it heat. Add chopped dry fruits, fry it for a minute on low flame. Add mawa(khoya), cook the mawa for a minute on low flame, keep stirring. Turn off the flame and let it cool down completely. Once the mawa is cold, add sugar, cardamom powder and roasted coconut, mix it properly. 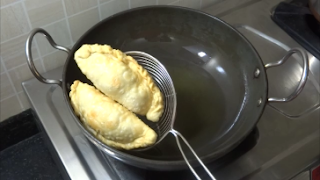 Grease the gujiya maker or mould with ghee. Take a small portion of dough, roll it into poori shape. Place it inside the gujiya maker, put 2 tsp stuffing inside. Apply few drops of water on the edges of the poori, close the machine and gently press the edges. Take it out from the gujiya maker, Repeat the process to make gujiya from remaining dough. Heat sufficient oil in a deep pan, keep the flame on low-medium. Drop a small ball of dough to check the temperature of oil. Place 3-4 gujiyas at a time in hot oil, Fry it for 4-6 minutes on low medium flame, keep flipping in between. Take it out in a kitchen towel to absorb extra oil from it. Repeat the frying process for remaining gujiyas. Gujiya is ready to serve(Store it in a airtight container and consume within 5-7 days).